Could Singapore see a general election in 2019, when it celebrates its bicentennial the 200th year since Stamford Raffles’ arrival? prime minister Lee Hsien Loong has left the door open to such a possibility. 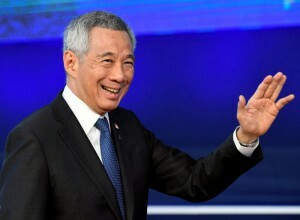 PM Lee was speaking at a dialogue held as part of a welcome dinner at the inaugural Bloomberg New Economy Forum in Singapore on Tuesday (6 November). The two-day forum is being attended by more than 400 big names in politics and business. The last general election in Singapore was held on 11 September, 2015, months after the death of founding prime minister Lee Kuan Yew. The ruling People’s Action Party won nearly 70 per cent of the votes cast, its best showing since 2001, a result partly attributed to the patriotic feelings from Lee’s passing. When asked whether the “next generation of Lees” would be entering politics, PM Lee noted that none of his children have shown any interest in doing so. The dialogue also touched on global issues, such as the ongoing trade tensions between the United States and China. PM Lee said that, if such tensions as not well-resolved, it will lead to broader conflicts that could stoke “mutual suspicions and distrust”. PM Lee believes that the terms on which China first joined the World Trade Organisation (WTO) 17 years ago need to be updated, as its global impact is different from what it used to be. For instance, when it entered the WTO, it made up about 4 per cent of the world’s Gross Domestic Product (GDP). Now it has gone up to 15 per cent. When Micklethwait pointed out that Singapore has played an “outsize role” in China’s development, PM Lee said, “They see us as a bonsai tree model of what China is. Hopefully some ineffable essence of it is useful to them, and they take it back and transmute it, and it may take root in China. “What they are intrigued in is how it is possible in Singapore to have free and open elections regularly, multi-party politics, and one party remains in power for such a long time. It is strange, but it is not a given outcome for Singapore either,” he added. The inaugural forum was originally to be held in Beijing, but coincided with a massive new import fair in Shanghai that had been endorsed by Chinese President Xi Jinping and taken on a heightened symbolic significance with the current trade tension between China and the US. Rather than postponing it to next year, the organisers shifted the forum to Singapore.